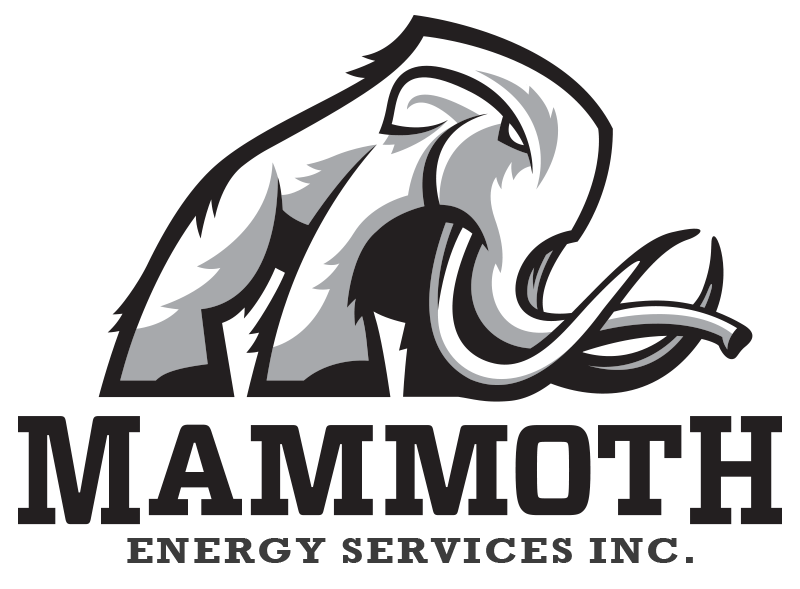 Sand Tiger Lodge - Mammoth Energy Services, Inc. 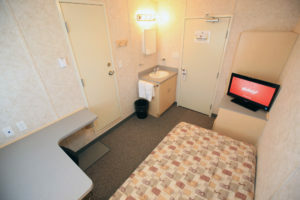 Sand Tiger Lodge, located in the heart of the Canadian Oil sands in Fort McMurray, has 876 beds with the comforts of home. More importantly, we have the finest living experience in the industry – our belief anyway! 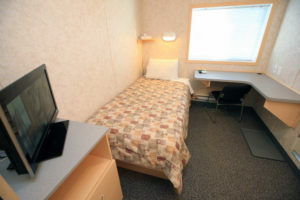 The overwhelming majority of the rooms are fully enclosed with arctic corridors, providing a comfortable environment for our guests regardless of the environment. 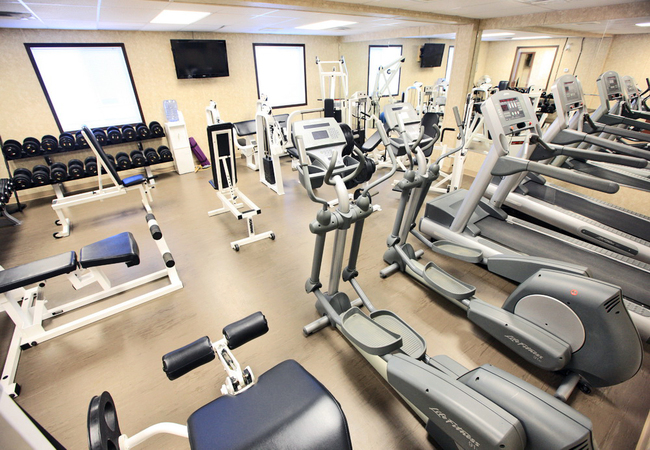 Sand Tiger Lodging offers Premier Executive, Standard Executive and Craft rooms along with common amenities that include fitness centers with Life Fitness and Universal equipment, theatre rooms and pool tables. 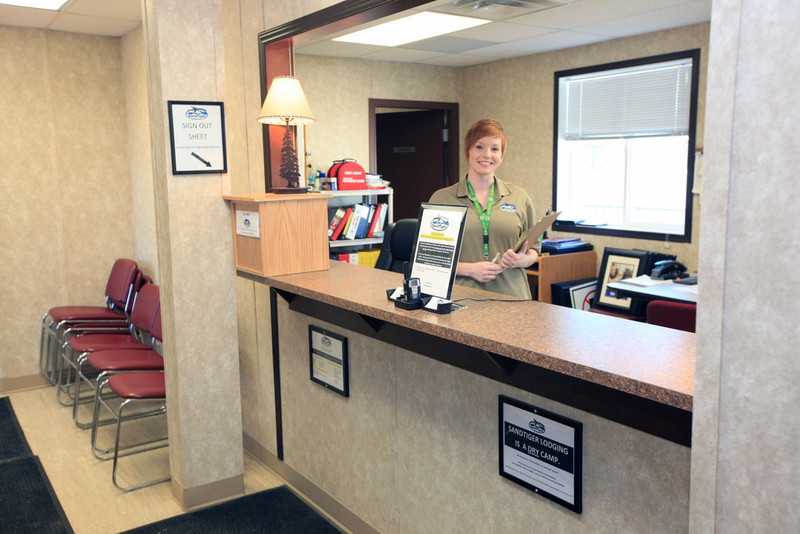 Conveniently located just off the newly expanded Highway 63, our Fort McMurray location allows working remotely to be safe and seamless. Sand Tiger Lodge provides your work force with recreation excellence. Our main recreation area includes a number of large flat screen televisions, fireplace and a variety of games for your Team to relax with when they are “off the clock”. 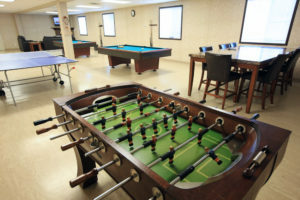 We offer shuffle board, pool, table tennis and Foosball, along with area tables and leather couches. For those who want to work out, we have a fitness studio with Life Fitness and Universal equipment. We have cardio equipment and free weights to keep your Team in shape. For those less active and wanting to just lay back, head to the Theatre Room. Filled with leather, reclining chairs, a big screen TV with surround system, your Team can watch movies or sports events in the greatest of comfort. Finally, those who want to surf the web, head back to the work station area. 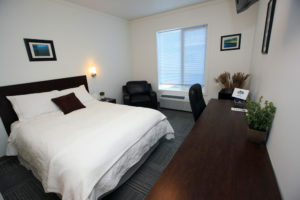 Use our computers and the complimentary wireless internet to stay connected with the world and family. North Country Chefs have hundreds of meal selections and recipes in their repertoire. 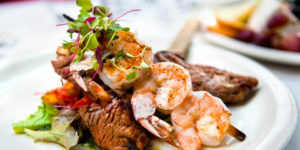 Meal variety is critical, yet Chefs maintain a balance of providing the most popular dishes. All Managers and Chefs constantly monitor feedback from our guests to ensure we are providing the type and quality of meals they desire. At Sand Tiger, it is about personalized service. When there are concerns or challenges, we take action immediately. If you or members your Team have dietary concerns, we will make every effort to address them and exceed expectations. Our goal is to ensure we are your Home – Away From Home. Turn West (right) on to Alberta Highway 69 & follow for approximately 7.4 Kilometers. Turn South (left) on to Alberta Highway 63 & follow for approximately 45 Kilometers. Look for Sand Tiger sign. Turn North (right) on to Access Road after sign at KM Marker 196 & follow for approximately 330 meters. Turn West (left) into Entrance Gate. Sand Tiger Lodging Front Office & Reception is directly ahead.